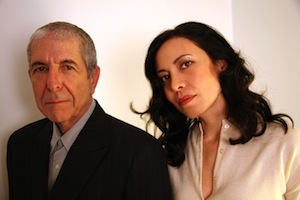 UPDATE: Thanks to “Sochi” for pointing out that the pic below is Leonard Cohen and his partner, Anjani, not his daughter Lorca. Lorca photographed the pic. Canadian singer-songwriter Rufus Wainwright announced the birth of his daughter on his website today. Darling daughter Viva Katherine Wainwright Cohen was born on Feb	2, 2011, in Los Angeles, California to proud parents Lorca Cohen, Rufus Wainwright and Deputy-Dad Jorn Weisbrodt. The little angel is evidently healthy, presumably happy and certainly very, very beautiful. Daddy #1 would like to offer everyone a digital cigar and welcome the	little lady in with a French phrase from his favorite folk song, “A La Claire Fontaine": “Il y a longtemps que je t’aime, jamais je ne t’oublierai." 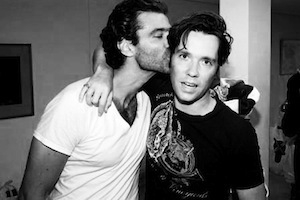 Rufus Wainwright (right) with Deputy Dad Jorn Weisbrodt. Lorca Cohen is the daughter of Canadian poet and musician Leonard Cohen.